Ladies Tableegh invites all girls in school years 8 and above to attend our first Noor Circle, a session of Islamic art and spirituality at Husaini Islamic Centre on Saturday 16th January 2016 from 6.00pm to 9.00pm. 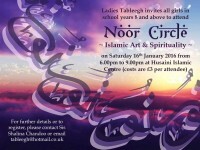 Costs are £3 per attendee. 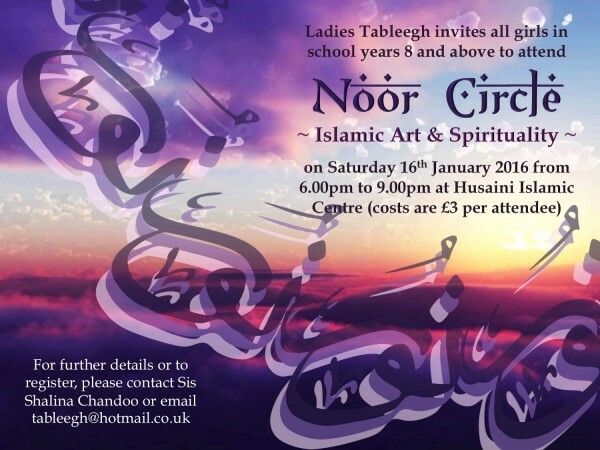 For further details or to register, please contact Sis Shalina Chandoo or email tableegh@hotmail.co.uk.